Bob Wilson is a member of the Manchester Golf Club in Bedford, N.H. He is a 12-handicap who has been golfing for 47 years, the last three decades of which, without the use of his legs from the knees down. Wilson is a bilateral amputee as the result of an accident while serving in the U.S. Navy. He is also the executive director of the National Amputee Golf Association (NAGA), editor of Amputee Golfer magazine, and founder, lead instructor, and coordinator of the First Swing Program, which teaches golf to the physically challenged. For golfers who think the sport is plenty hard enough, even with four working limbs, Wilson’s story sounds remarkable. As it turns out, however, there is a sizable subsection of golfers today who have overcome mobility issues in order to play the game they love. 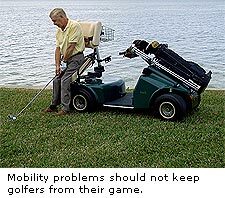 No reliable statistics exist as to the number of people with disabilities who play golf, but according to Wilson, a PGA survey indicated that 24 percent of golfers are not playing due to “injury.” And according to John Hikel, owner of Total Access Golf, a distributor for SoloRider single-rider golf cars especially (but not solely) designed for players with mobility limitations, 22 percent of paralyzed veterans express an interest in playing the game. The Americans With Disabilites Act (ADA) covers public and semi-private golf courses, ensuring that such facilities be accessible to the disabled. Nevertheless, adherence to the law has come only grudgingly. Making a course accessible means more than installing wheelchair ramps into the clubhouse. It also means allowing single-rider carts, such as the SoloRider, onto courses. According to Hikel and SoloRider users such as Martin Ebel and Bob Wilson, course owners and greenkeepers have to overcome a number of prejudices and fears before they embrace these carts. First and foremost among these concerns are cost and damage to the course. With respect to cost, Hikel points out that “Compliance with the law is far less expensive than a lawsuit, and besides, it's the right thing to do." With respect to potential damage to the course, new, well-designed auxiliary aids such as the SoloRider feature wide tires and weight distribution schemes that leave imprints on the greens no more sever than those left by golf shoes. 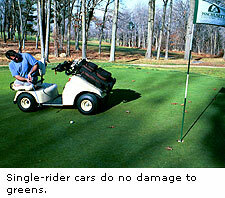 As such, the carts are safer for both the course and the golfers than traditional options. 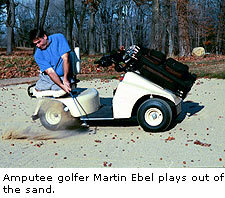 Martin Ebel relates how the new cart technology has helped him enjoy the game: “When I first started playing golf after my accident, I used a wheelchair. The narrow tires were hard on the greens, so I did not putt to avoid damaging them. There were also difficulties in getting from shot to shot in a wheelchair. Eventually, I, like many disabled golfers, began using a three-wheeled scooter to play golf. "While better than a wheelchair for hitting the ball and not damaging the course, the scooter was not particularly stable. I would regularly fall out of the scooter or tip it over.” Ebel was eager to try the adaptive single-rider cars like the SoloRider when they hit the market. He credits the SoloRider for providing him access to courses, as well as adding ten yards to his shots. For more information on resources for golfers with physical disabilities, go to solorider.com , amputee-golf.org, or totinbonezgolf.com. Hi, my daughter wants to caddy for her daddy but struggling to find a cart that we can adapt to be pulled behind her power chair and he has easy access to the clubs because our daughter has limited range in her upper extremities. Any suggestions? I have a lung condition which limits my ability to walk for long periods and I certainly am limited in how far and often I can walk during a game of golf. I take pulmunary Therapy twice a week for my condition and I also take medication and am under regular care of a Physician. I have a State Issued Disability ID Card, Drivers License, and Vehicle Registration (plate and hanging mirrior tag). I went on line an bought a "Handiapped" flag which goes on a golf cart. (Didn't even know they made such a thing). When I go to a golf course I show my ID Card and tell them I have my own flag . . . no course has ever given me a problem. I've always been told "go where you want, but please don't drive on the greens and tees and also don't drive in the sand traps. I'm 69 years old and I also play from the "RED" tees. I have a great time and I'm always thankful for the understanding nature of the course managers. Perhaps you can do the same! If you just met me on the street you'd never know I was disabled . . . but the fact is I am! I have lost my 2nd and 3rd fingers on my left hand and have not been able to hit the golf ball with any skill. I am right hand golfer. Would your golf glove help. Tell me about your glove. My left hand is stroke affected. My left wrist has severe arthritis and painful to swing a golf club. My fingers are getting hard to close, on both hands. I use graphite shafts and thick club grips. Can your golf Glove help me? I have a neuropathy which affects both feet. Muscles in feet, lower legs and ankles have atrophied.I wear braces and have trouble with my balance when swinging my golf clubs. Needless to say my swing has suffered. I need some help from a pro who is experienced with disabled golfers who can watch my swing and make suggestions about how I can best change my set up and swing to accomodate the disability. Any golf schools you can recommend? We are the United States Disabled Golf Association, WE are form to give disabled golfers a opportunity to compete in National event. Our website is www.usdga.net facebook at usdga.net and twitter @usdga, WE are having our first US Disabled Open July 2015 in North Carolina. Three category based off your golf handicap, overall as well. I have a friend who is a dwarf. He has a great swing and could be a good player, but he can't hit it far enough because of the club construction. All of his clubs are chopped short at the handle and loses it's kick and flexibility. Are there clubs made for little people? Should he consider junior clubs? I have both rotator culfs torn in both shoulders and they cannot be reattached so I am trying to find a pro to help me develop a swing where my shoulders don't come into play. I have invented a golf club for use by those who cannot swing a golf club. It can be used on any golf course with damaging it. It is in early stage of development and I am seeking backers thru Kickstarter http://kck.st/1DNEyRq. This club is designed for ordinary people who might like to play golf and is not yet sanctioned for USGA events. I believe it will open up the game of golf to approx. 500,000 disabled people in this country alone. I need help moving it to production. I wish you all well as you enjoy the game of golf. I was injured falling of a ladder 14 feet high. I crushed 7 bones in the elbow, and broke 2 bones between the wrist and elbow. I was a 14 handicaper before the accident. I need help using my lower hips and legs to help with my distance. I love the game of Golf. Any suggestions? Where can I go to have a pro look at my swing. DO YOY KNOW IF THIS EQUIPMENT IS COVERED BY INSURANCE CO.S OR MEDICARE. THANK YOU. I fell on the ladder and busted up my right elbow to the point that it can't be bent. It's in a permanent 90%. Is there some thing i can do to put a decent swing on a bolf ball. Right now i can't seem to get it air bourn and i'm duck hooking every shot. I'm looking for some pro that can help me with my disability. Do you know of some one. I live in the Minneapolis mn. area. Do to nerve damage I play with 1 arm. I also went to golf college in Temecula, Ca. for 2 yrs. and earned a degree. As an instructor I can say that each person and their swing is different, disabled or not. Playing with 1 arm I have shot an 84 which was better than any score I ever had when I played with 2 arms. Maybe you can open your stance, and have your right hand on the club only half the swing, then let go and follow through with the left arm. Most of your power is in the left side (if your a right handed player). What I'm trying to say is that you CAN DO IT. It will take practice and maybe some trial and error. But, once you hit the ball well JUST ONE TIME you will KNOW which is the best way for you. It took me 2 years to find my best 1 arm swing and stance combination but when you find it you know it was worth the time and effort. Good LUCK & NEVER GIVE UP! We are the United States Disabled Golf Association, WE are form to give disabled golfers a opportunity to compete in National event. Our website is www.usdga.net facebook at usdga.net and twitter @usdga, WE are having our first US Disabled Open July 2015 in North Carolina. Three category based off your golf handicap, overall as well. This is the first championship well all disabilities are welcome as it relate to making a swing. Details is on the website. I would be interested in seeing what can be done to help you play golf and enjoy the game. I'm a teaching professional in Western, WI. I've recently worked with a man who has had 4 back fusions and a pin in his left wrist. I realize we are at the end of the season but I would like to talk to you. I'm in the process of trying to find grips for my father who isn't able to grip with his left hand. Helping the disabled golfer has become a goal of mine. As you Build up your control over the club head with you Left hand golf grip you can train yourself to move your right arm+hands to 'accompany'this new way with increasing club head speed. you may be served by making your shfts alittle lighter+more flexible with more kick at the business end of the shot. regards Marc Bright.. I have developed a tool to set the ball on the tee. Worth a look. Gives complete control from standing position, no bending, allows user to set ball on a tee. Also picks tee from ground after tee shot. Let me know if you and your friends are interested. My husband's hip replacements make it difficult to bend over and tee the ball. I tee his balls when we play. Is there a tool that can place a ball and a tee in the ground from a standing position? I live in Chico, California. I have a bad back, bad hips, bad right knee & bad right ankle. All from injuries. I am interested in your tool. Please send me pictures & prices including shipping costs. I might be able to get the local golf courses & clubs to handle them. I would love to see a photo of your tool. I have a fused back and drop-foot and bending to place a tee and ball is very difficult. I would be interested in seeing this also. Having also had spinal fusion and knees that also don't work right this might help me play a game I love. I am interested. Hurt in the service and after many operations cannot bend to place tee. Would like to see a picture of your tool & what the price would be. Have had spinal surgery and have a hard time putting ball on tee. I was looking for instruction on how I must compensate for grip and power loss in my left hand. I had a carpal tunnel operation (twice) that permanently damaged my nerves in my hand. The result of making my left hand inaffective to any strength or finger (digital) gripping power for my thumb, and the first and second fingers. I need to develop a new grip and was looking for any help regarding this issue. I am not looking to achieve my power drives of before,but, accurate 200 yds. in the fairway would be delightful. I also have lost grip and power in my left hand due to brachial plexus injury and a misdiagnosed trapped ulnar nerve.I have lost both my hobbies playingthe clarinet and golf, any news on equiptment for a disability such as mine would be much appreciated. I have a condition called foot drop on my left foot. Foot drop is a condition where the nerves connecting the spine to the foot are damaged and the individual cannot lift his or her foot into a normal walking position. Most people with foot drop wear a brace to keep the foot in a neutral position. I can walk with the help of a cane and I can walk without a cane a short distance as on a small green and tees that are not elevated. However a am very unsteady on my feet and sometimes fall on the tee or fairway. Also I cannot bend over far enough to retrieve my ball from the cup or my tee from the tee box. I know that this is nothing to what amputee golfers must face, but you or your organization consider this a handicap? a couple my local golf courses have, like PGA National in Palm Beach Gardens, FL, and the Champions Club in Stuart, FL. Both provide handicapped flags for my cart. very light and great for golf. We are the United States Disabled Golf Association, WE are form to give disabled golfers a opportunity to compete in National event. FMI Our website is www.usdga.net facebook at usdga.net and twitter @usdga, WE are having our first US Disabled Open July 2015 in North Carolina. Three category based off your golf handicap, overall gross as well. Jim McLellan: Confusion Feeds the Golf Industry!